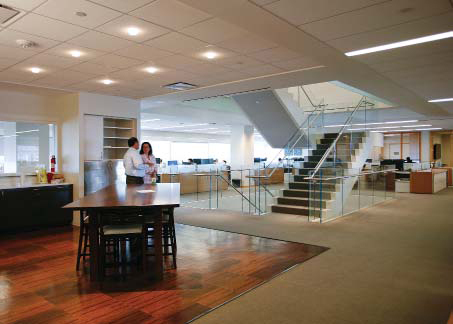 The offices of HMC previously occupied the 13th, 15th and 16th floors at the Federal Reserve Bank of Boston (FRB). The building is located at 600 Atlantic Avenue in Boston, MA. The project consisted of approximately 51,700 SF of interior renovation on floors 13, 14, 15 and 16. The multi-phased project started with the construction of a new data center on floor 13. Floors 13 and 14 were finished and occupied during the first phase of construction. The 25th floor served as swing space during the renovation. The existing trade desks on the 16th floor remained in full operation throughout the entire construction period.